An Ostrich named Colin caused a rush hour chaos after he ran between lanes on a busy road in the UK. 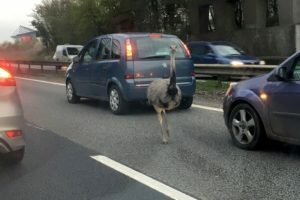 On March 21, an Ostrich that was brown and grey in color was spotted running between cars along the A12 in Colchester, Essex. Drivers had to slow down and had to switch lanes to avoid the running bird. A video that was shared online, showed 2 people trying to herd the ostrich away from the cars and on to the grassy part of the busy road. Colin was later on returned to Debbie Johnson, its owner, Debbie also confirmed that Colin also left his home to wander the roads in 2018. In one of the pictures that were taken, you can see Colin looking directly at the camera as he walks by the heavy traffic on the A12.